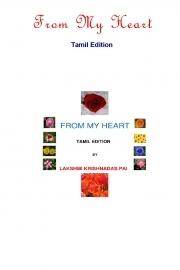 Description of "From My Heart (Tamil Edition)"
This book contains 20 poems on about 20 different topics in Tamil followed by their English Translation. The topics include god, devotion, love, music, nature, earth, patriotism, ego, fantasy and worship. The author, a lady poet, looks at life through her eyes and experience, developed the art of writing poetry in her latter stages of life and thinks that this was a gift given to her by the Almighty. This book of poems is through her feelings, and thinks that all human beings go through life in a similar manner, no matter where they live and what faith they believe in. This poet has written these poems from her life's experiences and imagination. She hopes to reach a large section of poetry lovers through her poems. It is but inevitable that subjective opinions punctuate her expressions. She makes no generalizations and she has no argument with any disagreements that may be felt by some of the readers. Reviews of "From My Heart (Tamil Edition)"